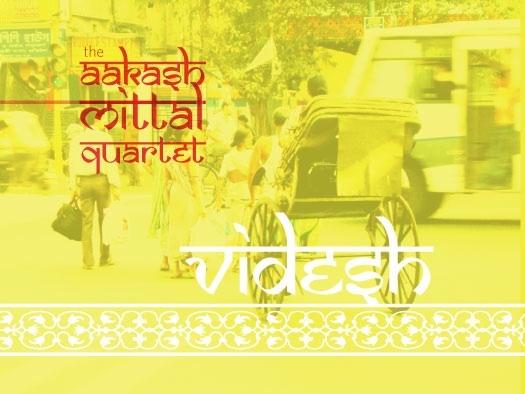 Aakash Mittal is a Colorado based saxophonist whose latest CD, Videsh, is a response to a visit to the land of his father – India. In Videsh, Aakash and his band-mates, Jean-Luc Davis, bass; Matt Fuller, guitar; and Josh Moore, drums; have successfully created a fusion of East Indian rhythms and American jazz. They are a young band, in their early twenties, and have the energy and freshness that often comes with youth. Mittal uses recordings he made while in India to provide atmospherics and help tell the story of his trip. 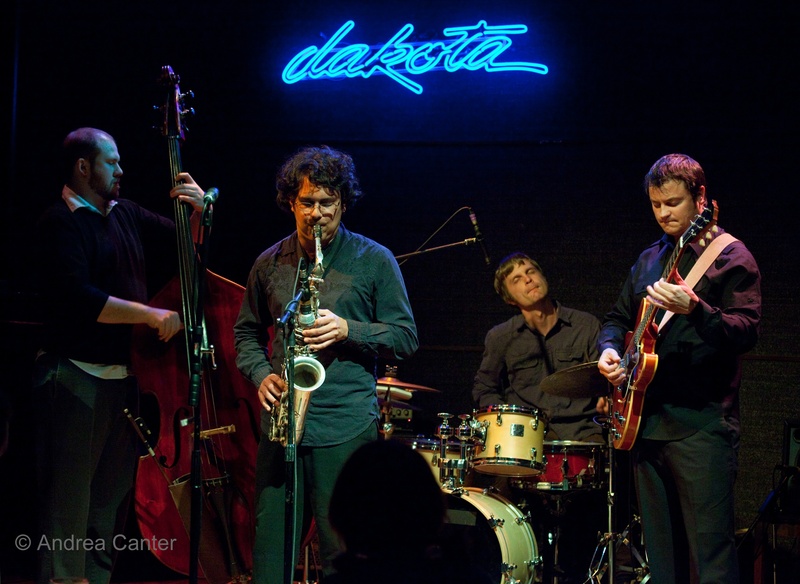 This was not their first trip to the Twin Cities, as last year, the quartet played at the Twin Cities Jazz Festival. Though I was unable to see that performance, their appearance at the Dakota’s Late Night series on the night of our interview proved that Mittal’s musical vision works. When taking solos, and during ensemble sections, each member of the quartet brought his A-game to the show, playing with vigor and imagination. An enthusiastic audience of mostly young people responded with cheers and applause and hung around after the set to talk with band members and buy CDs. This is a slightly edited version of an interview took place in the KFAI studio during Rhythm and Grooves. AM: Thanks so much for having us. LE: Who else do we have here? Jean-Luc: This is Jean-Luc Davis, I’m the bass player in the band. Josh: I’m Josh Moore, and I play drums. LE: Are you all from Colorado? AM: Basically. Actually Josh and I are originally from Texas, but we’ve been living in Colorado that I think we’re Coloradans. I think that’s the appropriate way to say that. I do believe that Jean-Luc and Matt are Colorado natives. LE: How long have you been performing as a quartet? AM: It’s been since 2007, so four years or so. LE: Aakash, your dad came from India? AM: That’s right, he was born and raised in New Delhi, then did a short stint in Germany, where he met my mother, and then when back to India, and they got married and moved to the States. So yes he is definitely full Indian. LE: How did you come about to choose jazz as a way to express yourself? AM: Well, it’s actually an interesting story. I got into jazz through dancing. In the 90s I got way into the swing dance fad and craze that came through. That was the first kind of music that I really started listening to when I was in middle school. I was the age when people start getting into their own music as well. One day I decided I wanted to play in one of those swing dance bands. So I had to transition from clarinet to saxophone to have an instrument to do that. Over time that has evolved into exploring actual jazz and getting further into it. LE: And how did you come to meet these other gentlemen in your quartet. AM: Well, I met Josh and Matt through the University of Colorado at Boulder. They were both attending, Matt was getting a Masters and Josh was studying Math and Physics. I met them both at a club we had down there called the Players Club. I think I just went up when I saw them performing and asked for their cards, and then Josh and I started jamming on free-jazz explorations and Matt and I would do the opposite and play quiet jazz standards as a duo for brunch places. Why not? LE: Jean-Luc, how did you get involved? Jean-Luc: I actually met Matt. We were both playing at the same club on different nights. Eventually, we crossed paths and started playing together through that. Around that time Aakash was doing his senior recital and Matt gave Aakash my name to participate in that. LE: How did someone who is into Math and Physics get into a jazz band. Are you still doing math and physics? Josh: No, Currently I’m trying to do music full time. I’ve pretty much always done music and I just kind of did the math and physics thing for a few years. LE: Well, music can be mathematical. All right, so you’re on a tour at the moment, and this is your first stop? LE: When did your album Videsh come out? LE: And this is an album that you produced after going to India yourself. AM: Yeah. The album was inspired by my first trip to India. Being of Indian descent has a particularly special meaning for me. I grew up hearing about it and seeing my dad hold onto his culture here in the U.S. It was great that I got to go and experience where my father was from and also a place that is so completely different than our world here in the U.S. LE: I’m not familiar with India, but everything I’ve heard and read seem to indicate it’s very different from the United States. LE: Here at this station, at least, a lot of people know about the music of Bollywood, and they know about the traditional music of India, but there’s not too much that we know about jazz in India. Is there much jazz in India? AM: There is some. I was actually quite surprised by the number of people, and the enthusiasm, at the Calcutta Jazz Festival. Calcutta is not even really as big of a city as Bombay or New Delhi, so a lot of people to whom I’ve mentioned we were going to a festival there, were surprised that they had one at all, but it’s been running for years now. There was definitely a lot of people. Whether they were as educated in jazz as a lot of American audiences I’m not sure. But they definitely enjoyed the music, and it had a great response. LE: There are an increasing number of artists who are integrating jazz and Indian music. The Miles From India project of a couple of years ago is a prime example of that. It’s a good example of how jazz, though an American music to start with, because of its ability to embrace other musics, is itself being embraced around the world. So you did this album in response to your visit. AM: Yeah. I made this trip, which was very short for how long the flight is, we only went for nine days, and I got to go with my family. And on the plane ride back I made a list of the ten or twelve things that made the biggest impression on me. Then I turned each of the different words on the list into a different tune and connected them all with a suite, to be performed continuously. That’s how it evolved, starting with that general idea, and then I sat down to the piano for a long time, trying to figure out the exact notes. LE: Now gentlemen, the other members of the quartet. I’m assuming you may not have been to India, so how were you interacting and figuring out what to do? Matt: I’ll pipe in real quick. At that time we hadn’t been to India. This last November Aakash took us all there, so now we are a little more educated about the approach to music though it’s still daunting (everyone chuckles). Yeah we just listened to some traditional recordings and faked it and did our best. But we’re studying it more in depth these days and figuring out what we’re trying to do. Luckily we’re addressing it from a jazz mentality, incorporating certain elements of the rags, and the rhythmic elements, but also keeping it improvisational. LE: Jean-Luc, it looks like you may have something to add. 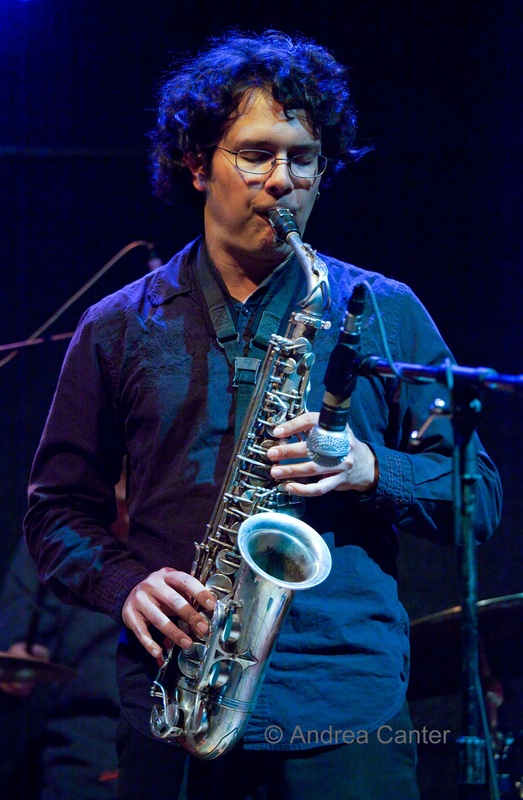 Jean-Luc: Just that it seems like a very natural progression for an American jazz musician to go through, because jazz has always been a harmonically deep language and it’s continued to get deeper and deeper. It seem that the last twenty years there’s really been a push to work on the rhythmic complexity of it and that’s something that … in the way that American music is harmonically complex, Indian music is especially rhythmically complex, so in studying music. In general, it felt like a very natural progression. LE: We’re going to listen to something from the album Videsh, a tune called “Ishaa.” Aakash, tell us something about this. AM: Well, Ishaa is a cousin of mine from New Delhi. As I was saying earlier, I made a list and wrote music based on some big events from this trip to India. Meeting Ishaa was one of those big events. She and I had never met before, but it represented meeting a whole side of my family for the first time. She and I connected more than anybody else. It was an incredible experience to find somebody who is like your sister. We hit it off right away and she felt like family, which is a tough thing when you’re in your twenties and have never grown up with these people and you’re supposed to call them aunt, uncle, things like that. You feel that they’re family, but you don’t have any experience with them, so that was really special. Especially because in Hindi there’s actually no word for cousin. They only have brother and sister because the extended family is supposed to be part of your nuclear family as well. LE: That was your cousin speaking on the track? AM: Actually I recorded her on my flash recorder a few times. We went in and edited it and added it to the music. LE: That worked out very nicely. What influences do you all have? Are they all over the map? Jean-Luc: It really is all over the map. Anywhere and everywhere. Matt: I feel with music there are commonalities between different genres and stuff. I listen to whatever I can to try and draw inspiration. Josh: I guess it’s the same for me. One of the things I love about this band is Aakash lets us bring whatever we’re into to the music. There’s enough freedom that we have elements of rock, obviously jazz, but a lot of different styles, a little bit of country. Whatever we’re feeling, there’s enough room to incorporate it. LE: Will you be playing just from the album tonight? AM: We’re going to do a mix of things. Some songs from Videsh. We might do a few pieces from our fist album, Possible Beginnings. We’re also going to play some new music. As part of our recent trip to India to play the Calcutta Jazz Festival in November we actually composed a bunch of new music while we were there. So we’ll play some of that tonight and on this tour then we’re recording it when we get back to Colorado, so we’re excited to be sharing that and see how it goes. LE: Work it out a bit? LE: Do you play any jazz standards and put an East Indian influence on them? AM: It’s awesome that you mention that, because tonight we’ll do some of that as well. We’ve got arrangements of “All the Things You Are,” “Take The Coltrane,” and “You Don’t Know What Love Is,” which reflect all our influences. Like our approach to “All the Things You Are.” It’s in seven divided up in ways that are not often used in jazz. In some ways that could be related to Indian music because they’re into taking a rhythm and cutting it up and mixing and matching it in different ways. It’s still “All The Things You Are,” but the harmony is redone so the only thing you might recognize is the melody. LE: Do you have a webiste? AM: I do. It is Aakash Mittal .com. AM: It’s at the beginning of the album That’s an important part of it as well, because it’s supposed to capture the feeling of stepping off the plane, and what it feels like to be in a completely different environment where there’s no traffic rules where people use there car horns like echo locators, where you don’t use mirrors, where there might be a cow in the road, where people live on the median and on the sidewalks, in addition to the incredible density of the population. I didn’t see it as much in Calcultta, but in New Delhi, whole families live in the median. What was amazing was you’d have a 5 yr old completely sacked out in the middle of the day in the middle of this noise pollution because he was so used to it. LE: Thank you so much for stopping by. We’re looking forward to the show this evening. This entry was posted on Monday, April 11th, 2011 at 1:15 am and is filed under Interviews. You can follow any responses to this entry through the RSS 2.0 feed. You can leave a response, or trackback from your own site.